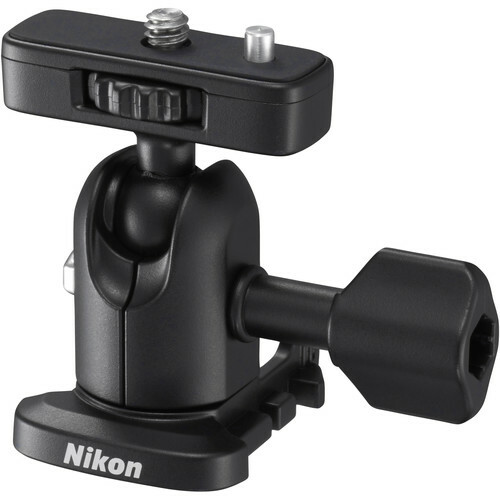 The Base Adapter for the KeyMission 360 & 80 from Nikon is a ball-joint support adapter that allows you to mount the KeyMission 360 and KeyMission 80 Action Cameras on adhesive KeyMission Base Mounts; and it allows you adjust the camera angle along the ball joint. The supporting Base Mounts are also used on many KeyMission support mounts, such as the Chest Mount, and the Base Adapter can therefore also be used to attach the camera on those supports. The Base Adapter attaches to/removes from Base Mounts by a quick release mechanism. Box Dimensions (LxWxH) 6.6 x 5.3 x 0.8"
Will this fit the KeyMission 170? If not, where is the similar accesory for it? Yes it will. All KeyMission cameras have 1/4-20 mounts.